As you can see from the specifications above, the Sony RX0 II is far from a normal action camera. Rather than a fisheye lens and video-only specifications, we get a stills-friendly camera with a (comparatively) large sensor and a truly miniature form factor. Whether or not it will be easy to use manual settings on this camera remains to be seen. Certainly, with such a tiny size and weight, compactness takes priority versus ergonomics as Sony’s goal – and for a lot of travel photographers, that’s going to be a good thing. I can see myself picking up one of these cameras as a last-ditch backup, or as a small and high-quality underwater camera (given its 10m waterproofness specification). In terms of its primary goal – as an action camera – the RX0 II also does not disappoint. 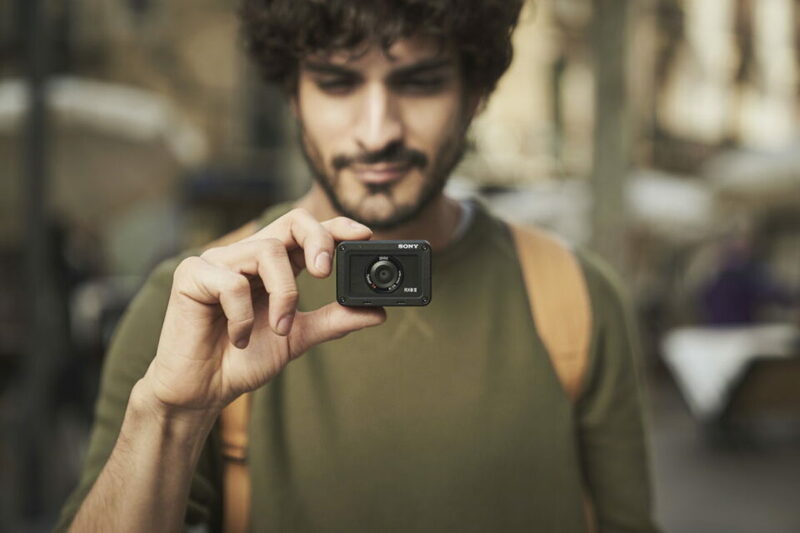 In addition to its waterproofing, it is also dust- and crush-proof, and it has up to 4K 30 FPS video (and 120 FPS video at 1080p). Overall, it looks like Sony has a very interesting camera on its hands. The RX0 II arrives in April for a suggested retail price of $700. You can read more about the camera here. Now that’s what we have been waiting for! Who cares about a Alpha 7S III or Alpha 7000??? Haha Alfred, no doubt that we’ll see the more important cameras later in the year. It’s a bit of an off-time at the moment. Footage quality has gotten pretty good on these cameras, considering their sensor size. I could say the same thing about smartphones. Especially with a one-inch sensor (and oversampled 4k), video on the RX0 II should be very usable. It seems that the earlier version suffered from some serious rolling shutter, so hopefully Sony has made improvements in that regard. I’d suggest if video of action is important to you, the GoPro Hero 7 is the only real option due due its amazing image stabilization. If stills are your gig, then the Sony might well be a solid back-up option if you don’t need aperture/composition (multi-focal length lenses) control. It’s clearly a winner for size and weight with so large an image sensor. The stabilization with the GoPro Hero 7 seems comparable to high end gyro work – however they are pulling it off. I don’t see it as travel friendly replacement camera, just a big sensor underwater camera. Many smartphones are going to gather more ligth and have higher pixel count and top smartphones have also 4k at 60p instead of 30p, more than one sensor with a different FoV to choose from and you are certainly going to bring your smartphone with you when you travel. Basically, the underwater/crushproof part of the camera is the only thing that it add that you can’t find in the phone is going to be already on your pocket. Very true, Tomas. Smartphones do compete with this camera in a lot of ways. In terms of sensor size, the typical smartphone has about a 2.7x crop compared to this camera, which is roughly the difference between this camera and full frame. Given that a lot of phones have wide apertures today (like f/1.8 on the iPhone X), you make a good point about light gathering capability – it’s not much better on the RX0 II. A fact made even worse given the relatively high base ISO on this camera, versus ISO 25 on many phones. Xiaomi and their cheap smartphones make thing even worse, because its new flagship Xiaomi Mi 9 use a 1/2″ and f 1.75 and cost 200 dollars less than this Sony, meanwhile the explorer version uses a f 1.46 and cost the same than this camera. Xiaomi put even on a under 200 dollars smarthpone that 48Mp 1/2″ sensor with f 1.8 lens, so even at that prize can beat this camera ligth gathering. The way that smartphones are catching up or just beating the slower camera segment is scary. The Hero 7 is a nice underwater camera, and you can buy a cheap underwater housing that makes me more confidant that the camera is safe. The underwater jpgs are very easily white balanced corrected. I haven’t played with raw underwater photos since the jpgs turn out so well. I don’t trust any “underwater” camera without a housing. The Sony has some very big footsteps to compete with. I’ll certainly be interested in how it performs underwater. I don’t really see any other use for this Sony camera. At twice the price of a Hero 7, it better be really good. Spencer, I think the sensor is 1″ but the camera uses only about 80% of it (15MP). So it is not a real 1″ camera, I guess? Can you check this? 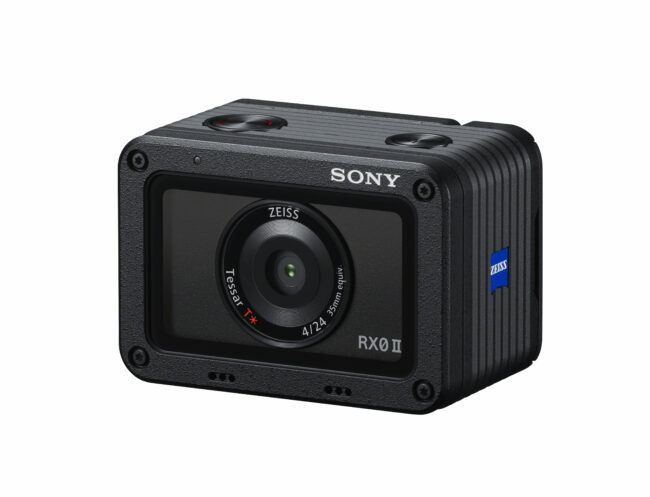 Just wondering if you can “wear” this new Sony RXOII the same way you can wear a GoPro. Would the Sony be a good choice for point-of-view action footage? Or is the field of view not wide enough? I’d be interested to know how you can keep your shutter speed constant while filming underwater, given it has a fixed f4.0 lens. Above water/on land you can attach a vari ND filter (if camera in a cage with thread, I saw a rig like this recently). Only other option is by adjusting ISO to get correct exposure and that may not be the best way to go about it for highest quality results. If anyone can think of a solution I would love to know as this camera looks great otherwise.